Sister Maria Benedicta Blaine, I.H.M. 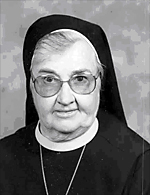 Sister Maria Benedicta, formerly Anna Mary (Nancy) Blaine, died on May 15, 2013 in Camilla Hall, Immaculata, Pa., in the 67th year of her religious life. She was 89 years old. Born in Chester, Pa., Sister Maria Benedicta entered the congregation in 1946 from Immaculate Heart Parish, Chester, and professed her first vows in 1948. She entered the congregation after receiving her R.N. degree in 1945 from St. Francis Hospital in Wilmington, Del. She was one of the original Sister-nurses who moved with the Sisters from Villa Maria, Wernesville, Pa., our previous infirmary, to Camilla Hall Nursing Home in June 1960. Sister Maria Benedicta served as a nurse in the community for over 60 years. For a brief respite in the late 50’s she taught first grade at Immaculate Conception, Levittown and St. Joseph, Warrington. During the last few years of her life, as her health declined, she served in the apostolate of prayer. The funeral Mass was celebrated at Camilla Hall on May 20. Father James McKelvey was the celebrant and homilist. Father William Dean was a concelebrant. Interment followed in the Immaculata Cemetery. In addition to the members of her Religious Community, Sister Maria Benedicta is survived by niece, Mary (Gary) Greco, a grandniece and a grandnephew. She was predeceased by her parents, John and Anna Hopkins Blaine and her siblings, Catherine and John Blaine.